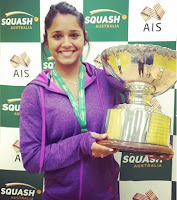 India’s top squash player Dipika Pallikal has won the prestigious PSA Australian Open held in Melbourne on 12th August 2016. In the 40-minute final match, she defeated Mayar Hany (World no 8) of Egypt by 10-12, 11-5, 11-6, 11-4 score. Pallikal was the top-seeded Indian, but perhaps had her loss in the final of the Victorian Open, the previous tournament, still on her mind as she lost the opening game. That shook her up, and she put up a strong front to polish off the next three games in style. This comes as great news ahead of the World Doubles in Darwin, Australia, where Pallikal and fellow squash queen Joshna Chinappa are the top seeds in the tournament next week.